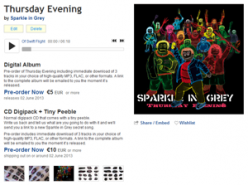 Sparkle in Grey: “Thursday Evening” new album – Chain D.L.K. Recorded by Andrea Serrapiglio (who worked with Carla Buzolich, Evangelista, Zu 93 and Scott McCloud), pre-recorded by Mario Bossi (of Arci Blog in Arcore), mixed by Matteo Uggeri and Andrea Serrapiglio and mastered by Riccardo “Rico” Gamondi (Uoki Toki, La Morte). 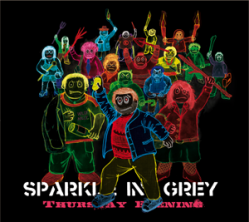 Once again Sparkle in Grey are making changes in their several styles, adding new, maybe harsher, shades to their unclassificable palette. “Thursday Evening” is as a heterogenous strange album full of bizarre surprises. It includes three covers and a secret song that will be sent to the (few) fans who’ll buy the record with its tiny pebble included and will contact back the band telling what are they going to make with it. You are NOT going to find it on iTunes, Amazon or any other distributor!